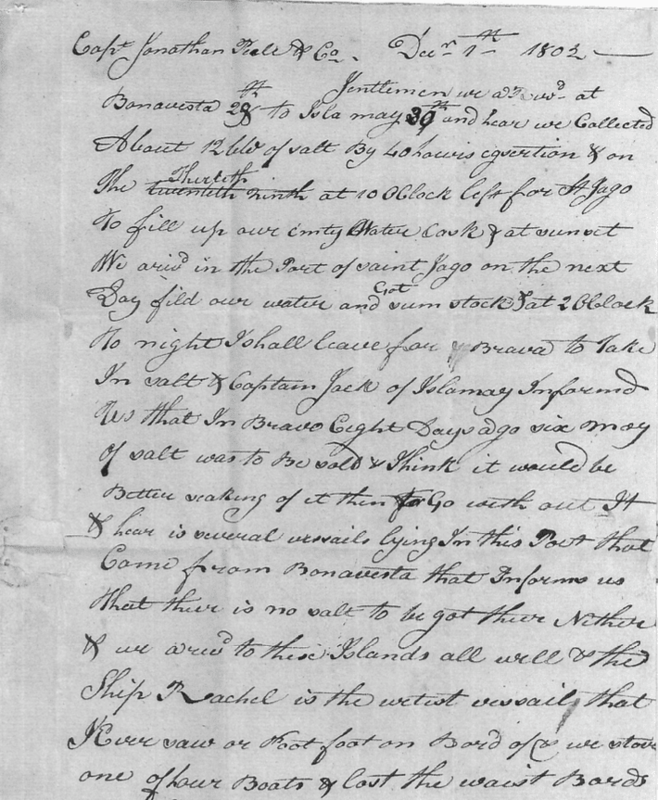 A letter from Calvin Bunker, Captain of the ship Rachel, to Captain Jonathan Peele, one of the ship's owners back in Salem. Note that the letter was written on 1 Dec 1802 - from the Jan 15 New York postmark, we infer that it was carried by another ship, taking 45 days to arrive in New York, where it was then forwarded on to Salem, Massachusetts. Click on the image below to view the full document in a new window. Gentlemen, we arrived at Bonavesta 29th to Isla May 30th and here we collected about 12 lbs. of salt by ... On the thirtieth at 10 o'clock left for St. Jago [Santiago de Cuba in the present day] to fill up our community water cask at sunset. We arrived in the port of St. Jago on the next day, filled our water and got some stocks. At 2 o'clock tonight shall leave for Brava.to take in salt. Captain Jack of Isla May informed us that in Bravo eight days ago six ??? of salt was to be sold and think it would be better taking of it than to go without. There [are] several vessels lying in this Port that come from Bonavesta that inform us that there is no salt to be got there neither. We are to these islands all well and the Ship Rachel is the ??? vessel that we ever saw or set foot on board. We stove one of our boats and lost the waist boards and hauled off ends of the fore topsail yard carrying steering sails. We have got a very good crew and most pleasable one that I have said to have on board a ship. We are all in good health and in hopes to make a good voyage. I remain your humble servant.